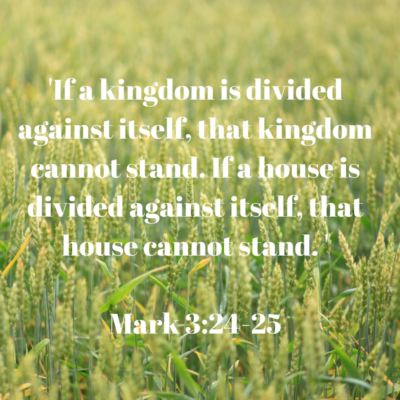 Jesus’ words here about a kingdom divided amongst itself falling still ring true in today’s society. All too often it is because of these divisions that we see things falling apart. Often times, this is the reason marriages fail. Instead of building one kingdom together, a husband and wife are still running after their own kingdom. She is chasing after hers and building up a kingdom in the way she believes it should be, he is chasing after a kingdom and building it up in the way he believes it should be. There is not one kingdom being built in the household and ultimately it all falls apart. Businesses often fall to the same predator. Inside the organization there are two different ideas of what should happen and the direction in which the business should go. One leader believes the company would be better served heading one way and toward one demographic or certain plan. The other leader believes the business would best serve the community if they headed a different direction. Neither of these opportunities may be bad, they are just different and as the leaders actively pursue different things, it causes the business to fall apart because there is no unity. This can also be what causes churches to split. One group of people believe the church should be serving a certain group of people and playing a certain style of music. The other group believes the needs of different people and a different style of music should be played. And slowly and surely two different kingdoms are built up and it is dividing against one another. You see the greatest thing the enemy of our souls can do is to cause us to fight amongst ourselves; to get us really caught up in trivial matters that don’t really matter to the overall goal of spreading the gospel of Christ. If we as Christians, are shooting arrows at each other, he doesn’t have to worry about us taking shots at him. So he tells us to go in different directions and break unity. We need to come together and realize, our enemy is not ourselves, or other churches, but our enemy is the evil one who has been sent to kill, steal, and destroy. The time is now for Christians all across the world to band together and begin to fight against the evil powers in this world.